My knowledge of Erickson's solo stuff more or less starts & ends with the quite excellent "Don't Slander Me" LP, aside from a few of his minor hits that others have covered, so I'm by no means well-informed on the twist and turns of his post-THIRTEENTH FLOOR ELEVATORS career. This is so much worse than I expected that it's hard to believe it wasn't thought of as a major stain on his reputation, rather than held up as the pinnacle of his solo career. 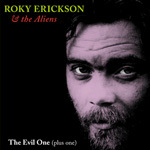 PAT BENATAR and REO SPEEDWAGON had nothing to fear from Erickson in this 1980 incarnation, which is total FM radio shlock if Roky's voice itself wasn't so sinister. Some people seem to think it's the second coming. WTF!?! So he was into demons and monsters -- hey, that's just great. The preposterous and patronizing deification of the mentally ill rocker continues, one of the lamest critical trends of all time. No wonder Disc 2 is devoted to a show he played on KSJO radio in San Jose, CA. KSJO was one of the two big-deal album-oriented rock stations in San Jose, where I somewhat regrettably spent my teen years, and even though the set is from the "Modern Humans" show (so new wave! ), the whole feel of this pop-heavy hard rockin' set of CDs is barely one step removed from Tom Petty & John Cougar (pre-Mellencamp). It was released on a major label in the UK and on a pseudo-major label in the US (415), and while that's not indicative of much -- a lot of new wavers & punks were getting signed during that 1978-79 period -- the mersh sounds herein help one understand why the A&R suits thought they could "break" Roky on the KSJOs of the world. I'm trying to get down with this one, I swear it, but what is it that you kids see in this thing?